Diffuser case- wrong bezels for either a Pratt & Whitney or Rolls Royce 757 engine. Turbine Fan- Wrong diameter for above, or the CPU, the third mini-motor that powers accesories. Wing Section- way to small and tapered to belong anywhere on a 757. Looks very Global Hawk. Tail Section- seen in security camera stills, exiting the explosive ejecta, final frame. It is of the "inverted v" form, not the "low T" found on a 757. Inverted "v" coincidentally, is used on the Global Hawk. Now, about the destruction of evidence. Also attached is a photograph of the Pentagon Lawn Crew. Debris is being removed, rather than being flagged in place, as is the NTSB protocol for aircraft wreckage. The people in this line are largely civilian. They, according to one who has come forward, were commandeered from stopped traffic on I-380. Look at their clothing. Either it's okay to wear jeans and hoodies to work at the Pentagon, or they are ordinary civilians, just like our source claimed. 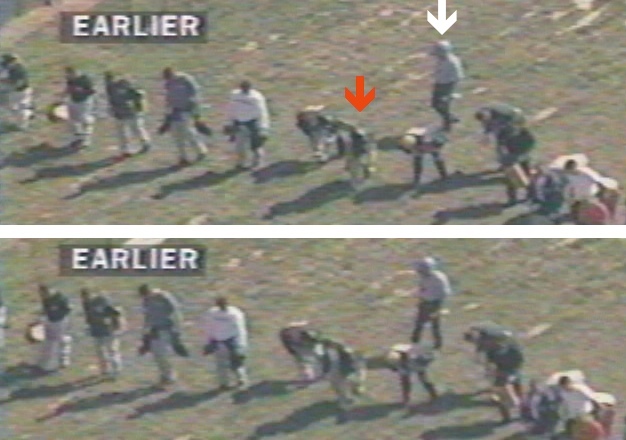 Other Pentagon employees photographed that day were either in military dress, or suits and ties. They have black plastic garbage bags tied around their waists. I don't know about you, but I'd need more than a Hefty bag to pick up 80 tons of aircraft. Little, if any debris can be seen on the lawn. What was on the lawn has been described as "carbon fiber, bonded to thin aluminum" by this source in the line. I do not have permission to release this person's name. I offer this information qualified as such, and also cannot verify this person's claim. 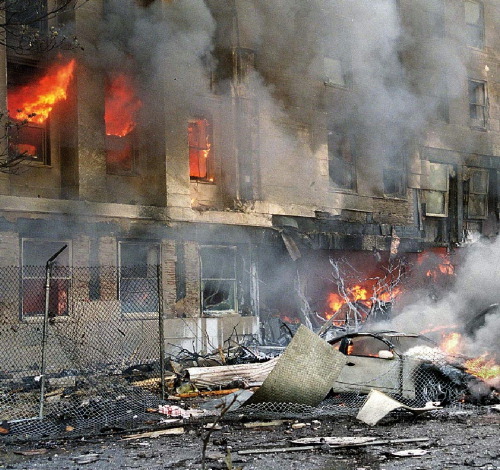 Aside from the description of the debris, little else could be disputed about this information by examining the photo closely. So, if there was an urgency in removing this debris, on what basis was it justified? I posit that it was because it was immediatley recognizable as non-757 debris. I welcome your comments on this opinion. At the Pentagon, we see only ONE landing gear and ONE rim, both having traveled the full distance of the alleged crash. Where are the other 2 landing gears and 9 rims at the Pentagon? Did the rest just "burn up"? At Shanksville ALL 3 landing gears and 10 rims are missing. Did they all disintegrate after hitting that "soft dirt" there? Killtown on Tue, 12/05/2006 - 1:47pm. Agreed, and also this to consider . .
Something else to consider about the landing gear. We don't know if the "757" was alleged to have come in gear-up or down, but at max throttle, they were almost certainly stowed in the retracted position. pilotsforthetruth has done an excellent dissertation of the flight data recorder information, I'm certain they could tell us whether the gear were deployed. IF they were stowed, the gears would have been encased in an aluminum container of quite robust design. When gear doors are opened, there is a tremendous drag on them, the gear, and the supporting framework within the airframe. Where I am heading with this is that this 757 gear, that was either found or "salted" into the Pentagon debris, should be well entwined within the gear storage bay components, not looking up at us in a nearly un-entagled state. craniac on Tue, 12/05/2006 - 1:59pm. have been planted there fairly easy. Most of the debris seen outside the Pent isn't even burnt or scraped even after it supposedly slammed into a fortified wall at 530mph. The most obvious planted debris is at Shanks where we are told the plane burrowed underground (tailsection and all), yet two medium sized fuselage pieces escaped and are found in the forest under the cover of trees and somehow a pristine red bandana is found. Killtown on Tue, 12/05/2006 - 2:09pm. Duh!.... those planes crashed.... you should be looking for "chrashing gear"
Anonymous (not verified) on Tue, 12/05/2006 - 2:03pm. Anonymous (not verified) on Tue, 12/05/2006 - 3:38pm. Who ever suggested that every piece of Pentagon debris was photographed, and every one of those photos has been posted online? We have no idea how many wheel rims or landing gear assemblies were found. In any case, please elaborate on your theory of how all these 757 parts were planted. Anonymous (not verified) on Tue, 12/05/2006 - 2:09pm. before the day of the crash. That small section of the Pentagon was being renovated for a long time, and many objects could've been planted/hidden in there over time. Anonymous (not verified) on Tue, 12/05/2006 - 2:18pm. I mean there is really not much to elaborate on. Maybe you can elaborate on what happened to the missing 2 landing gears and 9 rims? How about elaborate on what happened to the tail section and why all those pieces of debris seen on the outside are unburned and nonscraped? Killtown on Tue, 12/05/2006 - 3:17pm. you do know that the Pentagon was emptied numerous times during the rescue effort on 9/11 because of reports of incoming "aircraft" right? more than enough time to get the cameras and prying eyes away. numerous times. Chris on Tue, 12/05/2006 - 3:27pm. Camera's galor around the Pentagon (The most protected building in the world) and the films released show jack sh*t.
WISDOM on Tue, 12/05/2006 - 2:44pm. We can go on & on about all the information we have.Which should be MORE than enough to proceed with a criminal investagation. To think we need a public confession is absurd! We need Congress to do there job,and answer the questions! WISDOM on Tue, 12/05/2006 - 2:49pm. WISDOM on Tue, 12/05/2006 - 4:40pm. People who want to come up with alternatives to Flight 77 hitting the Pentagon really should study the crashes into the Trade Center more closely. Is there any plane debris ejected in the direction the plane came from? No. Are there any intact pieces of the plane that survived and came out the other side? No. Is there any evidence that ANY large pieces of the plane remained intact inside the towers? Nope. Anonymous (not verified) on Tue, 12/05/2006 - 1:58pm. First, let's talk about the security camera stills. These are in the public record. Every unique source of these photos has this piece of debris in it, if presented in an uncropped format. It's not altered. Second, the wing piece. It's a complete wing section. Any Aeronautical Engineer will point out Bernoulli's taper, in it's entirety, in the cross section. (The shape needed to form a low pressure area over a wing, and provide lift.) No wing would have multiple tapers. Identifying compressor rotors is very difficult. Often the modern replacements have a very different appearance from the originals. Some had tie-rod holes added due to FAA safety changes over the years etc. The same rotor may have been used at different stages of the engines as well. The little slots can have any size fan blade put in them or not at all. I investigated the RB-211 which N644AA had on it and also the JT8D which was on the 737 and A-3 Skywarrior. I made no positive ID on either. I'm afraid that the only way that we'll know for certain is if somebody can find the same age engine that Flight 77 had on it (then you'd have to know the engine replacement history) and find an old one to dismantle. And I'll post some intact pieces coming out of the WTC towers in a little bit. Good rebuttal, though. Nice to see such a prompt and courteous reply. craniac on Tue, 12/05/2006 - 2:17pm. You don't have to identify the exact compressor rotor to know the size of the engine it came from - and it's clearly impossible for a rotor that big to have come from anything much smaller than a 757's engine. Anonymous (not verified) on Tue, 12/05/2006 - 2:41pm. You can go to judicialwatch.org and see the same debris in the ejecta, and many, many other sources. I re-state that these frames are in the PUBLIC RECORD.Now that you've had it pointed out, you will even see it on network TV. God knows I'm not handy enough at IT to hack all these sites and TV channels to insert an airplane tail. Yes, that's my crappy little arrow, which should indicate the paucity of my IT talent. I can't help the resolution, it's all the government released, which in itself should be quite suspect, given the array or security cameras around the Pentagon which would undoubtedly provide a better picture. "I investigated the RB-211 which N644AA had on it and also the JT8D which was on the 737 and A-3 Skywarrior." craniac on Tue, 12/05/2006 - 3:17pm. I'm sorry, you misunderstand me. I'm not saying YOU forged the video, definitely not making any silly 'disinfo' accusations here or anything... I'm just saying that it's possible (likely) the video was altered prior to being released and that makes it fairly poor evidence as to what type of plane it is. The bright fireball does not affect any of the shadows in the foreground, suggesting an explosion could have been composited into existing footage. If this is the case, then any pieces of debris in the fireball would not help us determine what hit the building. Even if the footage was not altered, that doesn't change the fact that the tail of a plane hitting the first floor of a building like that could never 'bounce' into the position it was supposedly photographed in. The tail of Flight 77/A3/Global Hawk/a cruise missile would end up INSIDE the building, not a hundred feet above it. Therefore it's clearly impossible for your little black blob to be a part of the tail section. Anonymous (not verified) on Tue, 12/05/2006 - 3:48pm. Actually, and this is a good indicator of how silly the Skywarrior theories are, the JT8D was never actually used on the A3 - the JT8D is a civilian engine. Much smaller than an RB211 but a civilian engine nonetheless. Any theories about a JT8D engine at the Pentagon must assume that a decomissioned A3 was retrofitted with 727 engines prior to the attack. Obviously there is crossover in engine use, but the military doesn't employ civilian engines on fighter and bomber aircraft under any circumstances. Anonymous (not verified) on Tue, 12/05/2006 - 3:53pm. you didn't see any plane debris fly backwards when the explosion then the fireball shot backwards. Notice no jet fuel still burning at the facade gashes which are at the same angle and no plane debris seen around the gashes either. 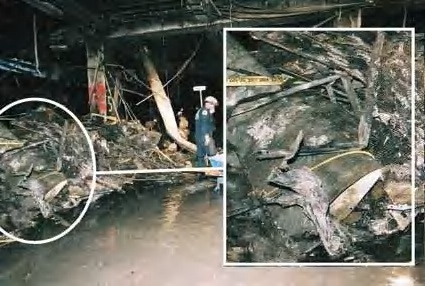 But large plane debris was found planted on top of WTC 5 right by a stair case and an engine and wheel assemble was found conveniently under a construction canopy. Killtown on Tue, 12/05/2006 - 2:28pm. Anonymous (not verified) on Tue, 12/05/2006 - 2:40pm. The same Sith lords who say NPT is "nonsense"? Killtown on Tue, 12/05/2006 - 3:13pm. Anonymous (not verified) on Tue, 12/05/2006 - 3:20pm. What happed to the fourth? Killtown on Tue, 12/05/2006 - 3:25pm. how a commercial airliner managed to squeeze its wings through a hole barely large enough to accommodate its fuselage, then proceeded to punch through 3 consecutive rings of the Pentagon, thereby rivalling the armor piercing capabilities of full-grown bunker busters. The mystery is also how it made a low-level high-speed approach, seemingly ignoring groundeffect altogether, whereby it dislodged lightpoles without getting severely damaged and off trajectory - all the while not being in accord with the NTSBs released flight data. Some pieces of trash found in the lion's den don't qualify as pristine evidence, making the debate whether or not this or that part belongs to a 757 moot, wouldn't you agree? bruce1337 on Tue, 12/05/2006 - 2:38pm. Anonymous (not verified) on Tue, 12/05/2006 - 2:42pm. bruce1337 on Tue, 12/05/2006 - 3:28pm. Show me one picture of this 16 foot hole. Every pre- collapse photo I've seen shows confirms that there was a 96 foot hole on the first floor (enough to encompass both engines and most of the wings) and a 16 - 20 foot hole on the second floor (for the top section of the fuselage). Anonymous (not verified) on Tue, 12/05/2006 - 3:39pm. Where have you been? Have you read any of our arguments? I'm sorry but I find this so unbelievable that you have not seen the photos of the Pentagon prior to the collapse of the facade. Have you seen any of our documentaries? JJJames (not verified) on Tue, 12/05/2006 - 3:47pm. "Have you seen any of our documentaries?" You mean like 'In Plane Site' and 'Loose Change'? Yes, and they're flat- out wrong about the Pentagon. The Government is deliberately letting no- plane theories grow by withholding footage, knowing they can discredit the entire movement when they prove that Flight 77 hit the building. Anonymous (not verified) on Tue, 12/05/2006 - 4:09pm. Anonymous (not verified) on Tue, 12/05/2006 - 5:13pm. bruce1337 on Tue, 12/05/2006 - 3:53pm. Yeah that car goes behind the firetruck in the picture I posted... Nice shot of the damage cause by the left wingtip, though. Make sure to widen your browser window to see the full image above, or visit the link here: http://911review.com/errors/pentagon/imgs/hole11.jpg. Impact DAMGE exceeded 140 feet, the wingspan of a 757. The impact HOLE exceeded 96 feet. To suggest that your image shows the extent of the impact damage is a perfect example of how no- plane theories rely on the misleading use of limited photos. Anonymous (not verified) on Tue, 12/05/2006 - 4:19pm. however, what about the exit hole? Don't you find it incredible that the landing gear's supposed to have punched it? bruce1337 on Tue, 12/05/2006 - 4:34pm. glad we're looking at this openly. The exit hole is definitely suspicious - however even if there were bombs in the building, that doesn't disprove that a 757 hit it. There's plenty of suspicious things about the Pentagon crash - most of them just don't indicate a military plane or a cruise missile any more than they do a 757. I think the landing gear of a commercial airliner is more likely to have caused that hole than anything else that could be associated with the crash (ie cruise missile warhead or fighter jet component), so it wouldn't take it as evidence of no 757. Just keep in mind that if Flight 77 DID hit the Pentagon, then the perpetrators have every reason to make us in the movement believe otherwise. Of course it would be possible to plant hundreds of 757 parts around the building in order to fake a crash (easier than demolishing the WTC, for example), but there's simply no reason for it. And if they're going to those lengths, they'd be pretty stupid not to forge a simple video of the plane going in - instead, they release a handful of frames whose ONLY purpose seems to be to leave the nature of the crash ambiguous. Anonymous (not verified) on Tue, 12/05/2006 - 5:04pm. bruce1337 on Tue, 12/05/2006 - 5:14pm. Anonymous (not verified) on Tue, 12/05/2006 - 5:30pm. Anonymous (not verified) on Tue, 12/05/2006 - 5:44pm. where did the plane hit again? Real Truther on Tue, 12/05/2006 - 4:56pm. JohnGault on Tue, 12/05/2006 - 5:20pm. "Nice shot of the damage cause by the left wingtip"??? Where does that scenario place the left engine? Is it back on the lawn? Or, is this a "no-engine" theory you propose? JohnGault on Tue, 12/05/2006 - 5:26pm. try to remember we're talkinb about a BIG plane here; if that picture shows the left wingtip damage, then clearly the engine hole would not be visible (notice the damage extends indefinitely to the right of the frame). Find other pictures and triangulate the location of that white car to the impact hole if you don't belive me. Anonymous (not verified) on Tue, 12/05/2006 - 5:50pm. may be "big" but it's still level, right? so again, where would the left engine be if the left wing tip created the damage above? JohnGault on Tue, 12/05/2006 - 6:40pm. The took several hours for the wall to collapse, with firefighters spraying it heavily. Prior to that time, the hole was approximately 14 feet wide. Anonymous (not verified) on Tue, 12/05/2006 - 3:40pm. Whenever the water gets muddy, and the fog thickens, whence comes bruce, with a purely scientific and solid shot across the bow. craniac on Tue, 12/05/2006 - 5:11pm. bruce1337 on Tue, 12/05/2006 - 5:17pm. A seperate rim and tire assembly can also be corroborated thusly." What about the rest of the plane, like the engines, 250 seats, luggage, etc.? Anonymous (not verified) on Tue, 12/05/2006 - 2:21pm. I BELIEVE NO 757 HIT THE PENTAGON. WISDOM on Tue, 12/05/2006 - 4:38pm. If dz will allow me to continue this thread, tommorow I shall post some of the known photos of the debris on the lawn. I will leave it up to the 9.11 blogger community to decide if and/or why certain areas of these parts have been obviously blurred. craniac on Tue, 12/05/2006 - 7:53pm. I, too, was glad to see a more reasonable discourse in the recent comments. I agree that any non- 757 debris would have been removed immediately. Also, the lack of NTSB investigation of any of the alleged crashes is unprecedented and is further evidence of a cover-up. I do have a question (surprise!) about the "positively identified items". 1) A landing gear strut can be proven with reasonable certainty to be that of a 757. -The strut in the photo appears to be rusted (indicating it was not recently part of an operating commercial jet). -The photo contains anomalies related to lighting and shadows. -The location of this strut is unclear and nothing within the image identifies the location. What is meant by "can also be corroborated thusly"? JohnGault on Tue, 12/05/2006 - 2:23pm. Regarding your question . . I truly agree with all of the anomalies you present in the photos of the 757 debris. I am merely suggesting by allowing the gear strut and rim as "reasonably certain" that in side by side comparisons to known 757 components, they appear to be correct. In no way will I make the leap that just because they are the right parts, that they confirm the presence of Flight 77.
craniac on Tue, 12/05/2006 - 3:06pm. JohnGault on Tue, 12/05/2006 - 3:47pm. Thanks. It's really an excellent quote. I use it for several reasons. The anguish of spirit may refer to the loss of our national pride, given the obvious participation by our government in the 9.11 attacks. It may also subtly refer to a 9.11 truther having to part with a pet theory when evidence indicates it should be done. I have my pet theories, and some of them are not popular with the mainstream truthers. I am very careful about to whom and when I share them, as to not discredit the 9.11 truth movement. Should I have to part with them entirely when they are proven beyond the shadow of a doubt to be untrue, I will do so for the good of the movement. And a great day to you, John Gault. Thanks for the accolade. craniac on Tue, 12/05/2006 - 4:16pm. in "Loose Change" was particularly outrageous! They need to be subpoenaed & tell us why they were blatantly destroying a crime scene! Anonymous (not verified) on Tue, 12/05/2006 - 2:29pm. Perhaps a more easily prosecuted case of evidence removal is the WTC, not the Pentagon. There's too much confusion over the Pentagon evidence. But I think everyone agrees that the removal of steel from WTC was wrong. "Did they throw away the locked doors from the Triangle Shirtwaist fire? Did they throw away the gas can used at the Happy Land social club fire? ... That's what they're doing at the World Trade Center," the editorial says. "The destruction and removal of evidence must stop immediately." simuvac on Tue, 12/05/2006 - 3:50pm. has anyone gone to the website which is advertised on the banner hanging across the pedestrian bridge? John Milton was one of the originators of propoganda.... he also wrote "Paradise Lost"
JJJames (not verified) on Tue, 12/05/2006 - 4:27pm.